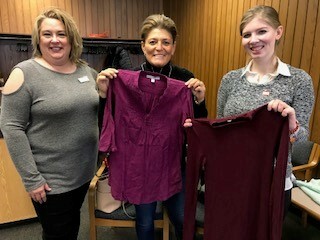 RRHRPA Kendra Hull (far left) recently presented representatives of the YWCA of the Sauk Valley with gently-used career clothing for use in their Upper First Avenue Clothing Boutique. Donations were made by RRHRPA members. The YWCA's boutique provides career clothing to their clients entering or returning to work. RRHRPA is proud to assist their efforts. RRHRPA is an affiliate of the Society for Human Resource Management. Whether you are new to the HR field or have many years of experience, we are a local starting point for networking, information, professional development, and continued support of excellence in Human Resources. We also encourage small business owners who may not employ a Human Resource Professional to join and take advantage of the frequent educational opportunities available. We welcome your use of this site as a resource, and encourage you to check back frequently for updated information. We also encourage your involvement and suggestions about all of our activities, on the web and off. You may contact us at rrhrpa@gmail.com. See our Scholarship under the More tab in the toolbar at the top of the page for more information and to obtain a copy of the application. Investigations: what to do after an employee tells you #MeToo. The Rock River Human Resource Professional Association began back in the 1980's as a sub group of the Sterling Chamber of Commerce. The group of eight men and two women represented the larger industrial employers. A while later, the group expanded to include Lee County employers. By the early 1990's, members of the group started receiving certification and joined SHRM. At the present time, Rock River Human Resources Professional Association (RRHRPA) is a professional association serving the Lee, Whiteside and Ogle counties and surrounding communities, dedicated to professional development and networking with local HR professionals. Even small businesses without a dedicated HR department can benefit from being a RRHRPA member. We currently have 47 members representing 35 different companies. Please see our Bylaws link on the About Us page. RRHRPA has a history of outstanding leadership designation with the Society for Human Resource Management (SHRM). These awards prove that RRHRPA goes above and beyond for its members and the community.